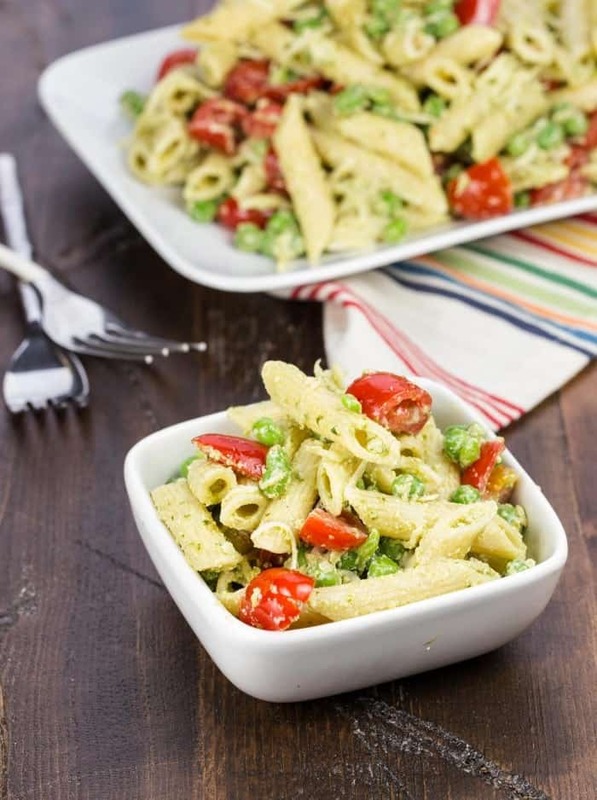 This Pesto Pasta Salad with Peas filled with tomatoes and pine nuts is the perfect side dish to anything that comes off the grill. There are many great things about Minnesota that make us take in these brutal winters, (although this wet, cold spring is really making me question our choice of where we live), but one of the biggest reasons for me is just around the corner: Summer. Summer in Minnesota is a pretty glorious thing. We have gorgeous lakes, warm weather, and people come out of the woodwork. True, there are a few mosquitoes, but you have to take the good with the bad. 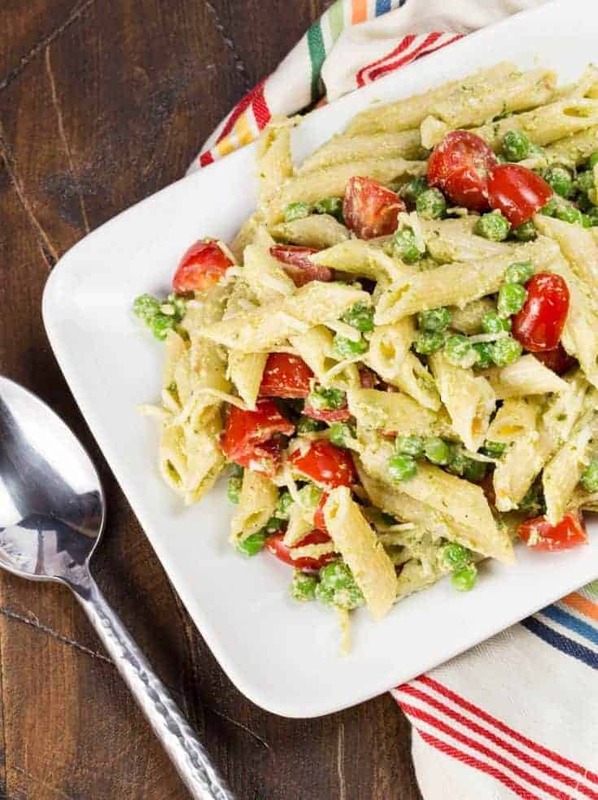 And when it’s nice out, I like to be hanging outside with the family instead of stuck in the kitchen cooking, which is why this Pesto Pasta Salad with Peas is my go-to summer side dish. But the best part is you can make it ahead of time and eat it at room temperature or chilled. How’s that for a no-fuss pasta salad? And since it’s not loaded with heavy mayo and has spinach hidden in the pesto sauce, it’s even a tad healthy to boot. So if you need me, I’ll be on the patio enjoying the sunshine. Which, after the rain and cold we have endured this spring, is well-deserved. Cook the pasta according to package directions. Drain and place in a bowl with the olive oil. Cool to room temperature. In the bowl of a food processor, add the pesto, spinach, and lemon juice. Pulse until combined. Add the Greek yogurt and pulse until completely incorporated. Coat the pasta with the sauce, and add the Parmesan, peas, grape tomatoes and pine nuts. Stir and serve at room temperature or chilled. So summery!! It makes me want to take the cover off the grill and have a good old fashioned cookout. Yum! I’ve decided that pesto just makes everything better. This pasta salad would make such a great side for a Mother’s Day BBQ!